Damn it feels good to be alive today! Dang! I’m feelin’ good today! A new comic book store just opened in the Mission District. It’s been almost two years since the Mission District has had a comic book shop. 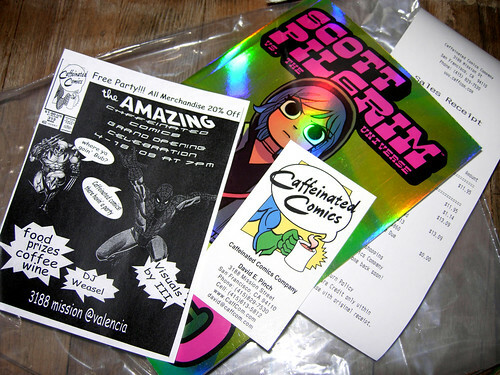 Both the legendary San Francisco Comic Book Co. and the mediocre Scott’s Comics have perished in the face of gentrification in the last four years. I was blown away today to see that the hipster economy of the Mission District has returned comics to my hood. Caffeinated Comics is a a hybrid comic shop and cafe located right on Mission Street at the intersection of Valencia (where the old Taco Bell used to be). They’ve only been open for a month; even still, I can’t believe I let something like this slide under my nose. I didn’t try the coffee but they had a small but decent selection of mainstream comics and graphic novels. Since it’s only two blocks from where I live, best believe I’ll be hitting it up again soon. I also got to hang out with my homegirl Cary Cordova today and we got a chance to engage in some serious discussions of identity politics.